Built in 1917 as a “club” for Cuban cigar makers and their families as their home-away-from-home, it soon became the center of social and community life for the Cuban population in Key West. After the original Cuban Club burned down in 1983, it was restored and converted to luxurious and spacious suites. The Cuban Club Suite stands as an award-winning historical landmark converted to a spacious and luxurious two bedroom suite filled with all the amenities of comfortable living. 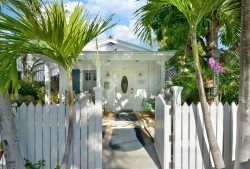 Climb the stairs to your personal Key West retreat with gorgeous high ceilings throughout. The first bedroom downstairs has a queen-sized bed with an en suite bathroom. The loft master bedroom has a king-sized bed, queen-sized sleeper sofa, and an en suite bathroom. The living room is also furnished with a queen-sized sleeper sofa and flat-screen TV. Enjoy your very own private balcony overlooking the hustle and bustle of Duval Street. There is a table for six located off the living room and full-equipped kitchen. Walk to the two shared pools only 3 blocks away! The maximum people allowed in this property is 8. If there are more than 8 people are in your party upon arrival, your party will be asked to leave without compensation. Parking: One off-street reserved parking spot, with on-street parking also available. Sleeping Arrangements: 1 king bed, 1 queen bed, and 2 queen sleeper sofas. Location: On 1100 block of Duval Street! Individual making the reservation must be 25 years or older with proper identification and be an occupant of the property. The maximum people allowed in this property is 8. If there are more than 8 people are in your party upon arrival, your party will be asked to leave without compensation. Violation of ANY house rules will result in your party being asked to leave without compensation.